Choza, a new outpost of the Open Air Cafe restaurants located in Manhattan's Financial district has made its way into Midtown. And there must be a reason. Well there is...their stuff is good. Real good actually. I was happy to be invited there last week, and along with work friends, Leann and Tara, we embarked on a deliciously colorful and filling journey of Mexican fare. Although Choza is a no frills, small place with maybe 3 sit-down tables and two rows of stools, it's worth the visit whether you dine in or take out. There's not much of an ambiance, as it's more of a grab and go type of place, but we did take a seat and found our surroundings comfortable. As soon as you walk in, you'll notice the service area up front, where you choose your food. If you don't feel like sticking around and eating here, Madison Square Park is conveniently close by and could be a nice way to enjoy Choza's eats. 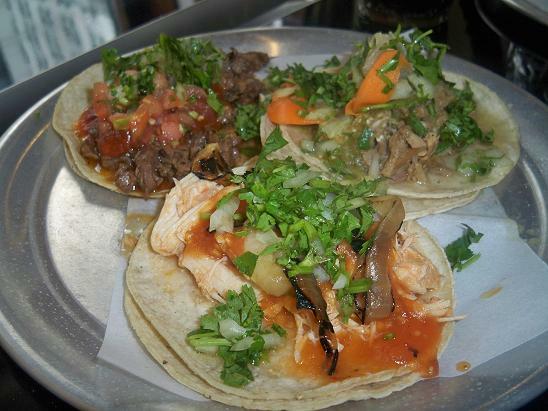 Choza's offering is simple yet very enticing, consisting of tacos, burritos, salads and a couple of daily specials. Given this straightforward menu, we seized the day and went for it all. Even though we had some clear stand-outs, for the most part, everything was really fresh and enjoyable. 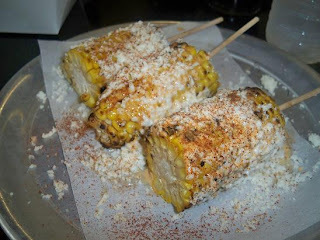 Elote Corn - If you're wondering what this is exactly, just take a gander at the picture above. 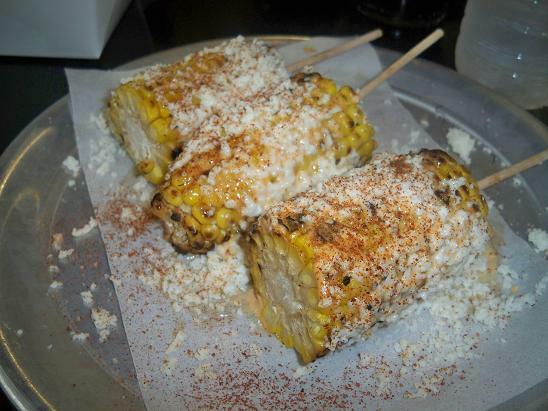 Also known as Mexican Corn, Choza's version was truly spectacular. We bit into each piece with gusto and enjoyed the soft, juicy kernels that were slathered with spicy mayo, zesty lime juice and soft-as-snow queso fresco. We all agreed that this was corn on the cob raised to the nth level. Chips and Guacamole - The best part of this side dish were the chips, as they were crunchy, airy and obviously homemade. We popped them like candy and dipped them into the creamy guac, which in my opinion could've used more spice. 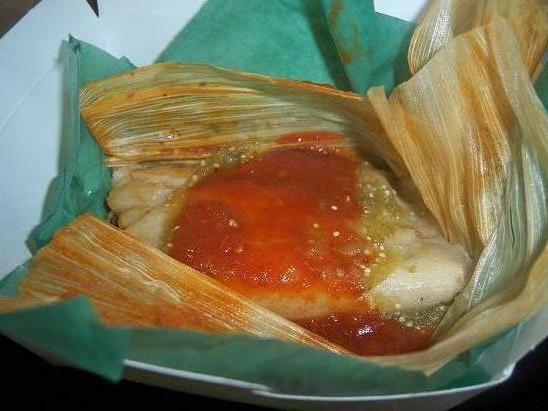 Pork Tamale - A special of the day, I was curious to try it because I generally love tamales. After chomping on the first bite, I was surprised that it wasn't on the regular menu. The soft corn filling was decadent and not unlike a thick pudding that melded beautifully with the slow-cooked pork. Topped with a mild salsa verde and salsa roja, the flavors in this dish sang--and because it's corn-based, it was also filling. Tacos - Hands-down my favorite part of the meal, everyone agreed that Choza's tacos were exceptional. I loved the double soft corn tortillas that I learned come from no other than my favorite tortilleria in Queens, Nixtamal. Right away, you can tell that the tacos exemplified quality, just from the way they looked - sturdy tortillas, beautifully colored meat and fresh salsa on top. We ordered four different types including chicken, chorizo, beef and pork. Out of those, I preferred the chorizo and the pork because they had the most kick, tickling the tastebuds to euphoria. The other three varieties were also yummy but were on the milder side. Burritos - Leann and Tara both ordered chicken burritos and seemed to enjoy them. Unsurprisingly, they were hard to finish because of their large size. I had a bite just out of curiosity and found that the tortilla got a little soggy from its contents. In my personal opinion, I'd stick with the tacos, tamales and that delicious elote corn. The service was lovely and very personal. We felt that the employees knew a bit more about what they were serving than in your average taqueria. I'd say that overall, the service seemed very efficient - for example when a long line formed towards the mid-point of our experience, it seemed to go rather quickly.